Astronomie - Terrawatch: is this how plate tectonics gets started? 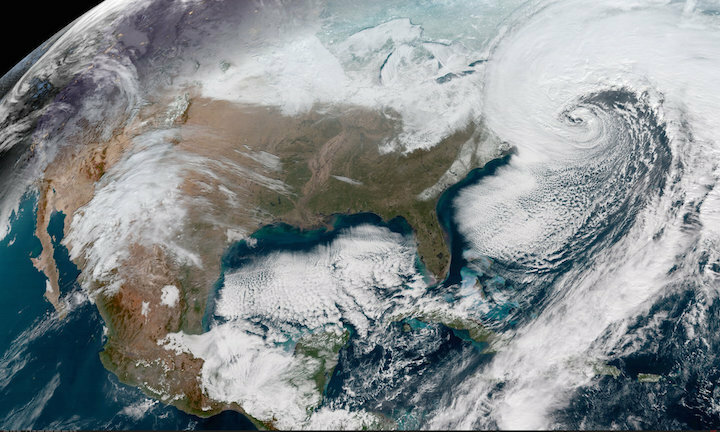 The GOES East satellite recorded this view of bomb cyclone Grayson as it battered the northeast U.S. on Thursday (Jan. 4). 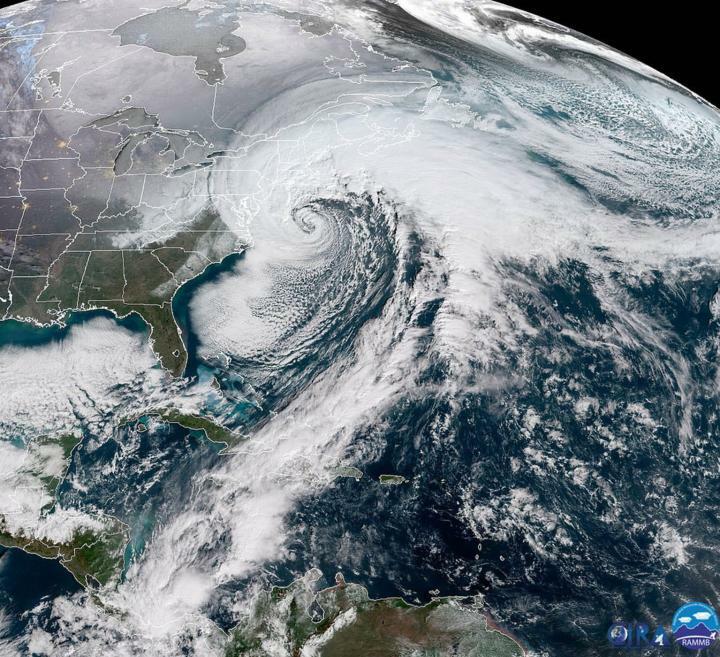 As a powerful bomb cyclone winter storm curls across the U.S. East Coasttoday (Jan. 4), the National Oceanic and Atmospheric Administration's (NOAA) GOES-East satellite is snapping stunning images of the Earth's surface. A bomb cyclone occurs when a weather system's atmospheric pressure drops incredibly rapidly, causing it to quickly increase in strength and whipping up hurricane-level winds and often heavy snow over a broad area. Two other photos released by NASA and NOAA zoom in on the "bomb cyclone" as it progressed throughout the day. One jaw-dropping view is a so-called Geocolor image of Earth by GOES-East. It shows the United States in vibrant colors, with the swirl of the bomb cyclone churning along the East Coast. "Geocolor is a multispectral product composed of True Color (using a simulated green component) during the daytime, and an Infrared product that uses bands 7 and 13 at night," NASA officials wrote in an image description. "During the day, the imagery looks approximately as it would appear when viewed with human eyes from space." Another GOES-East image shows the sheer size bomb cyclone storm by overlaying outlines of U.S. states and countries in the Caribbean, Central America and South America. "The powerful nor'easter is battering coastal areas with heavy snow and strong winds, from Florida to Maine," NASA officials wrote in an image description. "Notice the long line of clouds stretching over a thousand miles south of the storm, which is drawing moisture all the way from deep in the Caribbean." 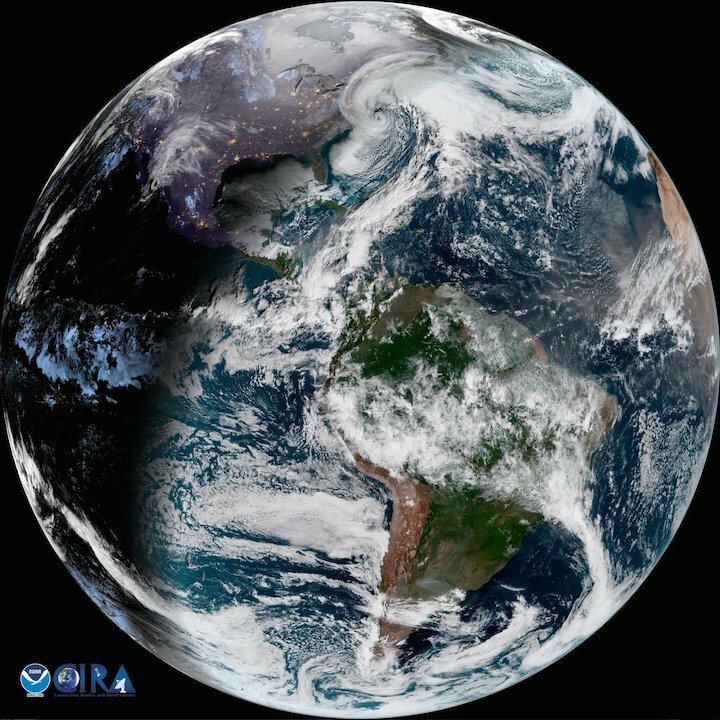 The GOES-East satellite officially reached its weather-monitoring position in orbit in December, where it views the entire Western Hemisphere from a high geostationary orbit — it stays still relative to the Earth's surface as it orbits and the world turns. The satellite's powerful imagery will help forecasters track storms, hurricanes, wildfires and more as they move across the globe. GOES-East marks the first in a series of satellites set to provide high-definition storm imagery; a second is scheduled to launch in March. "For weather forecasters, GOES-R [series, including GOES-East] will be similar to going from a black-and-white TV to super-high-definition TV," Stephen Volz, assistant administrator for NOAA's Satellite and Information Services Division, said before the satellite's launch. "For the American public, that will mean faster, more accurate weather forecasts and warnings. That also will mean more lives saved and better environmental intelligence for state and local officials and all decision makers."